This was a first for me. 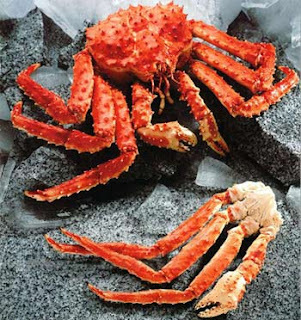 I've had snow crab legs before a few times at some buffets, but I'd never had king crab before - especially live king crab. Well, now I have. And it was awesome. But be forewarned, the price is not for the faint of heart. A few of my friends and I got together for dinner one weekend to celebrate the holidays. I've seen live king crab at a few restaurants in Chinatown, but most commonly at East Ocean City - so that's where we went. We ordered the crab and had it prepared two ways. The legs were steamed with garlic and the head/torso (does a crab have a torso?) was fried with salt and pepper. Let me tell you it was DELICIOUS! If you have some sort of occasion to celebrate - this is definitely one way to go. And now for the pricing. We asked for the smallest crab they had (there were only 5 of us eating) and it ended up being 6 lbs. It was $45 per pound making cost a total of $270. In my opinion though, it was totally worth it. 0 Response to "Live King Crab - Pricey But Delicious"